Completed in rapid succession, these two projects called for milling, paving, concrete repairs, utility adjustments, and the installation of temporary and permanent pavement markings. 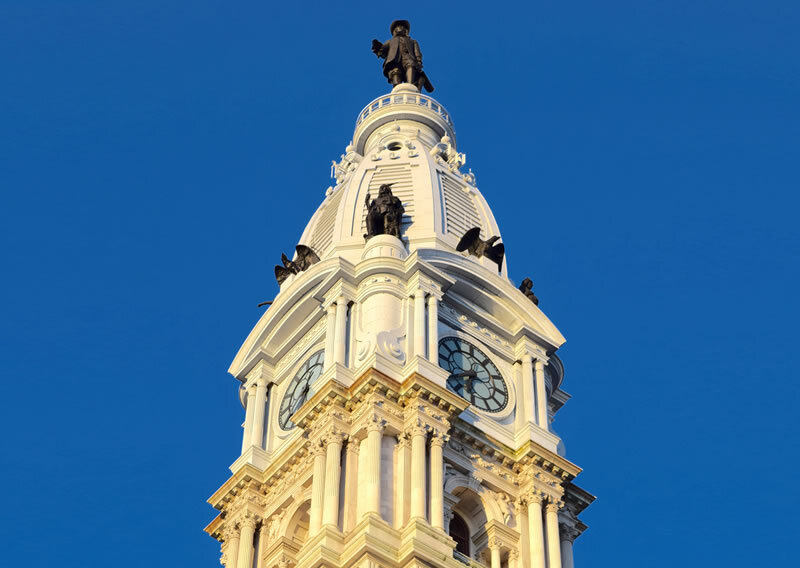 The first project (ECMS 105285) was completed under the watchful eye of William Penn, from high atop City Hall. This project involved the Center City district, starting at Spring Garden Street and heading South past the Convention Center, around Dilworth Plaza and City Hall and ending up at South Penn Square. The second project (ECMS 106436) started within the shadows of the South Philadelphia Sports Complex, home of the Eagles, Phillies, Flyers and Sixers and ended at the gate to the Philadelphia Navy Yard and I-95 Interchange. Both high profile, high traffic volume projects were completed at night and during non-event dates in order to minimize traffic and pedestrian interruption. The pavement marking subcontracts called for temporary striping to be installed nightly, immediately following milling and paving operations. The temporary striping was installed between 4:00 am and 6:00 am, prior to lanes being reopened to traffic. The permanent striping for the projects required both hot extruded thermoplastic and preformed thermoplastic. The striping not only required the re-installation of all lane lines, bike lanes, stop bars, crosswalks, legends, symbols and on street parking in the City Hall area, but also the adjustment and re-alignment of stop bars and crosswalks at intersecting streets, in order to comply with the latest City of Philadelphia Standards. Preformed thermoplastic was utilized for the “611” State Route Shields and “95” Interstate Route Shields. Both contracts had all permanent striping in place in just over one week from the last day of paving. Zone Striping, Inc., would like to thank long time and highly valued customer, James J. Anderson Construction Co., Inc. for the opportunity to work on these projects.